Convert a collection of photos around an object from drone, DSLR, or smart-phone into an interactive 3D PDF using PhotoModeler and PDF3D ReportGen. The process of capturing a 3D digital model from an actual object is often performed using a digital camera and photogrammetry to reconstruct a 3D geometric mesh with texture derived from the original photos. This sample illustrates the process, taking a large collection of good quality photos from various angles, then using PhotoModeler software to perform the mesh reconstruction. The desktop application software used in this example is PhotoModeler software by the Canadian company PhotoModeler Technologies (also known as Eos Systems Inc.), using advanced photogrammetry methods refined by over 25 years of advanced 3D modeling and imaging technology. Regardless of the source of imagery (drone, DSLR, or smart phone) the science is the same: light hits an object, reflects, passes through the lens and is captured on the camera’s image sensor or film. Using multiple photographs from different angles the software can compute the position of a point in 3D space by simple geometry from these light rays. This geometry is based on: a) where the point is imaged on each photo, b) the parameters of the camera (focal length, lens distortion, etc. from camera calibration), and c) the relative positions and angles of the camera when the photos were captured. When there are matching locations of multiple points on two or more photos, there is usually just one mathematical solution for where the photos were taken, so the 3D position of each camera shot, and view direction can be calculated. The key algorithm in photogrammetry is called ‘Bundle Adjustment’, that takes advantage of the massive processing power of modern computers to adjust the solution until the bundle of light rays between all points and camera positions is optimal. This is definitely not something to attempt inside a camera or smart phone. Once the 3D mesh is generated, it is saved to OBJ format with a special compact single JPEG image containing packed texture fragments. These files can be large due to the density of the surface mesh reconstruction – in this case the OBJ was 140Mb, with an associated 2k by 2k computer-generated texture image. By using PDF3D ReportGen, the OBJ 3D mesh is converted to a much smaller 8Mb PDF file, including all the mesh geometry and texture. To achieve good looking results, a brochure layout was created in Word, then used as a background design reference. The 3D mesh conversion used PRC tessellated high compression, and optimal texture processing insured a good visual result. The 3D material settings were adjusted to lower diffuse and specular terms and increase ambient to preserve as much of the original photographic lighting and shading as possible, without introducing artificial lighting in the 3D scene. The result can be viewed, rotated, zoomed using the Adobe Reader, simply by opening the PDF. Left mouse moves provide rotation, while right-mouse zooms in to see details, even the wood grain. The sample illustrated is from a Haida artist and is displayed in front of the First Nation Pacific North-West Totem Carving center on the historic Granville Island. Two totems, both featuring salmon, frame the entrance to the carving Longhouse. 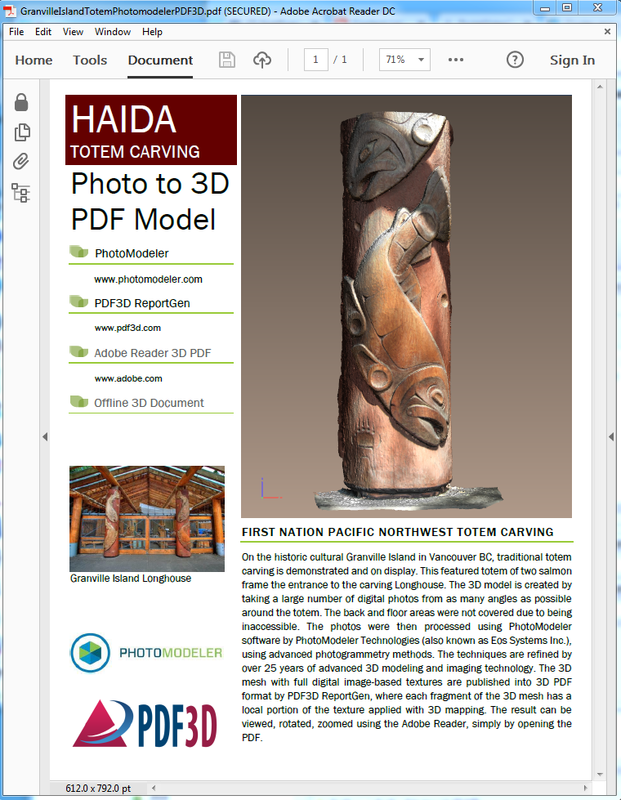 The 3D model is created by taking many digital photos from as many angles as possible around the totem. The back and floor areas were not covered due to being inaccessible.